Tags: Antonio Esfandiari, high stakes, Justin Bonomo, Texas Holdem, Tom Dwan. Posted on Thursday, August 09, 2018 by "T". 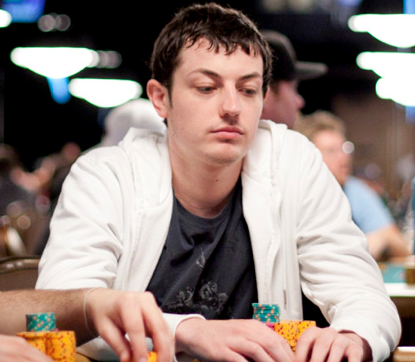 Tom Dwan explains in his own way what's wrong with playing Texas Hold'em live these days. In the interview he wishes to keep recreational players active in the game and shares his insights on what else is wrong with poker tournaments. Tom "durrrr" Dwan doesn't like to play No-Limit Hold'em anymore. In a recent interview made by PokerNews, he said his reason is more fun-centered than it is for profit only. In his point of view, poker is a game, not a sport, and the over-studied world of NLHE players actually bores him. 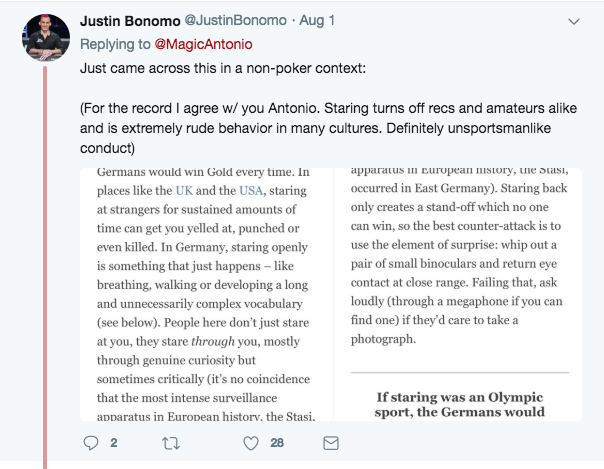 However, the biggest crime he revealed as his reason for quitting the game type entirely is the overly serious way in which every player insists on staring you down in Every Single Hand. It is quite alright if there is a huge decision to be executed (for instance, if you paid the buy-in for High Stakes Poker which was $100,000). For most seasoned poker pros, the staredown is one of the moments in playing poker that makes poker what it is. Sitting very still trying your best not to show any signs of weakness or acting cool after you made bluffs while under the intense scrutiny of your opponents and ending up winning is the absolute thrill in this game. However, ever since Dwan made an appearance on High Stakes Poker where he made a long thoughtful stare down to an all-new level of extremeness, other players have copied the move, right down to the limp wristed shove and the slack jaw. In Twitter, other players have expressed their thoughts in response to the interview - and most of them agreed to Dwan's sentiments. Currently, Tom Dwan very much prefers Triton Hold'em (also known as short deck poker). He mainly plays high-stakes cash games in Macau. Tom Dwan Engaged and Moving to Vegas? 16 comments for "Why Tom Dwan Quit Playing Texas No-Limit Hold''em Live"
His reasoning is not a bad one, and the most improtant thing is to enjoy what you are doing, besides making money. I think not just him. Few pro quit to play ( not forever, lol ) and then they come back. Maybe not too active like before, just sometimes. I don't believe they will not want to play forever. One day they will miss this game. Like us .Do you ? Does not add up. He no longer likes no linit hold'em but playes triton hold'em, that is basicly no limit hold'em with a reduced deck (no 2s,3s,4s,5s). May have to do more with the preference of the players he has to play in Macau, than his own choosing. Tom Dwan he feels intimidated when the players look at him to the hands he played. Probably he makes a comparison and has the impression that is at the zoo. This impression is shared by other players, but they should not feel intimidated. I think he has a little phobia because money are very good when you can easily win them. He must accept these situations and to make money. Imagine all the staredowns he's gotten from the people who lend money to him and then they want it back, yet Tom is pretending he does not own them anything then flew to Macau to keep these people out of bothering him. tax policy of many countries. from all theses new players, playing live. So reading them correctly is a must in a tournament. That goes for Dwan for example reading the new players. so it is easier to "study" him. To the deciphered chapter i think that Tom Dwan does not do that because it was understood by many players. Something else is in the middle. Maybe love or boredom, he earned too much money in Asia and things can go on. My opinion is that: he has another reason for which he quits playing live poker holdem. I do not agree since it takes years trying to turn poker into a sport of mental skill. At the same time, all players look for a profit in it, of course everyone sees and thinks according to their point of view, that opinion should be debatable. who talk like that already made enough money to change the idea of &#8203;&#8203;poker. Poker is not a sport, even if some people think so. Poker is a competition in a game of mind and skills, but when you sit in the chair and play poker, is not called sport. I do not understand why Tom Dwan he feels timid, when other players watch him with insistence, when he plays a hand with him. Is very bizarre.